Now all of those Proles in Prada have something new and fresh to wear, in case they are beginning to think that their Ché t-shirts are becoming très démodé. Yes, Dzhokar Tsarnaev, the surviving Boston Marathon Bomber (I dispense with the media-obligatory "alleged" adjective), with 'surviving' here meaning that in addition to the four people killed in the terrorist attack, along with 265 injured (31 critically), he also managed to run over and kill his brother while fleeing the scene of a shootout. But say what you will (and does it really matter to the publishers? 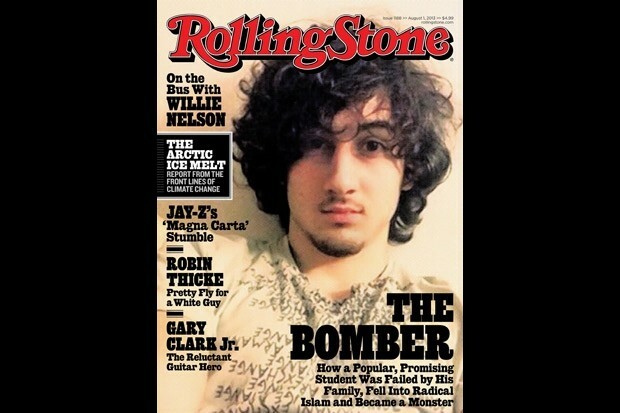 ), Tsarnaev is now declared an official rock star. 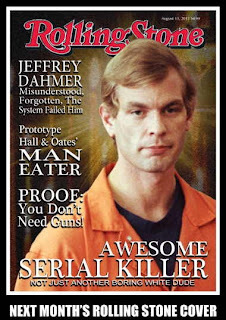 Rolling Stone sets about defending the cover (you know that they had the excuse written and proofed well before the publication) with the usual blather, which in this case is that it is a "riveting and heartbreaking account of how a charming kid with a bright future became a monster." 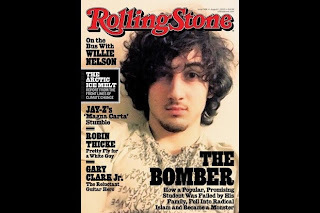 By sheer coincidence I'm sure, the publishers hope that pandering to this terrorist rock star will cause a surge in its steadily declining circulation, as "newsstand sales – a major indicator of a magazine's health – tumbled 10% in the six-month period ending last December, according to the Audit Bureau of Circulations." This is as it's forced to compete with rags mags like Spin and the new Blender. Jann Wenner, the Dorian Gray that founded Rolling Stone, has his expected defenders. Erik Wemble, media critic of the Washington Post, affects a jaded ennui with the reaction and "our country's tedious outrage machine". But cooler heads are righteously exploding with the comparison to Jim Morrison. There is a huge Twitter response ("horrible", "stupid", "tasteless") with threats of (even more) cancelled subscriptions. National drug store chains such as Walgreens, Rite-Aid, and CVS have announced that they will not stock the magazine, in addition to the Boston-area grocery outlet Roche Brothers. Boston Mayor-for-life Thomas Menino, hardly a reactionary conservative, blasted the story as an "obvious marketing strategy". So Rolling Stone joins the parade of media that rolls over a tragedy to make a buck. It's enough to give 'pandering' a bad name. But expect that the Chattering Class will roll out the First Amendment cliché, that the magazine has every right to expound on matters that should be hammered out, even provocatively, in the public square, and salute it for its 'courage'. I'm fine with that, for that right extends both to the courageous and the stupid. And so shall we all express our First Amendment disgust and God-given right to criticize that which we find reprehensible, and we can see how courageous Rolling Stone can be as it deals with the effect to its cause in the marketplace. Did you see where the Cambridge police photog got fired for releasing a blood-stained photo of the Boston bomber? Ours is a thug culture, like nothing we have seen since the glorification of Chicago mobsters (Guys & Dolls) and Bonnie & Clyde. Hey, we're on a roll. Why don't we demand "justice" for the police officer? After all, the law doesn't seem to matter any more - just what feels right. I correct myself: the officer was suspended, not fired, and Guys & Dolls was about NYC gangsters, not Chicago ones. How true. No one would suspect that someone as nice as Stubby Kaye could be a gangster from Chicago.